PASADENA, Calif. - Feb. 12, 2019 - PRLog -- PCO performs Boulanger's D'un Matin de printemps, Beethoven's celebrated Symphony No. 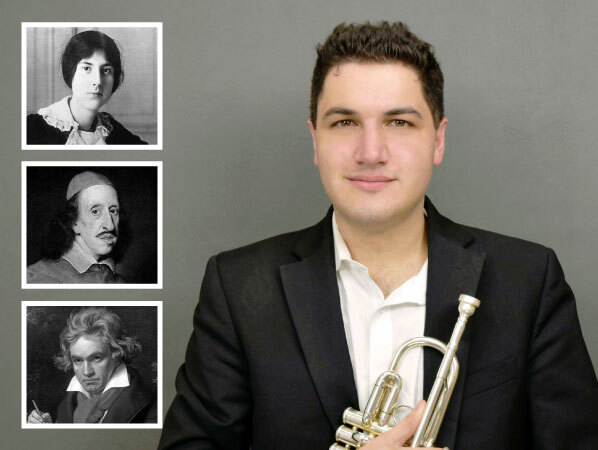 5, and Neruda's Trumpet Concerto, featuring soloist Cameron Ghahremani under the baton of Music Director Beth Pflueger. Female composer Lili Boulanger was a French child prodigy born in 1893. She came from a musical family of singers and composers and entered the prestigious Paris Conservatoire in 1912. D'un Matin de Printemps ('One Spring Morning'), written for violin and piano, was composed shortly before her death and has since been adapted for orchestra. The piece is a joyful nod to Debussy and was considered progressive for its time. Beethoven's great Symphony No. 5 in C Minor was written between 1804 and 1808 and was dedicated to Russian Prince Lobkowitz and Count Andreas Razumovsky. Eventually the piece came to epitomize Beethoven's life and musical style and has been used in popular culture and inaugural events ever since. Beethoven revealed in 1801 that he was beginning to lose his hearing and once wrote about the 5th that it is about "fate knocking at the door". Johann Baptist George Neruda was a classical Czech composer who wrote his 3-movement Trumpet Concerto in E-flat Major during the baroque era. The repertoire was originally written for a hunting horn or corno da caccia. The present version of the piece was published in 1974 by a famous trumpet player by the name of David R. Hickman. The sound and range of this concerto is an unusual work for the modern trumpet. Dr. Ghahremani has worked with professional bands accompanying multiple musical productions with the American Musical and Dramatic Arts Academy, Cupcake Studios and Musical Theatre West. In addition, he has performed with the Westlake Village Symphony, Golden State Pops Orchestra, and the acclaimed contemporary chamber orchestra, Kaleidoscope. Cameron began his collegiate studies at the Eastman School of Music where he studied with pedagogue James Thompson. Upon receiving his Bachelor's in Performance, he was awarded the Sidney Mear Trumpet Prize as recognition for his achievements throughout his undergraduate degree. Cameron is currently an instructor at the San Marino Music Center in Pasadena and is working as a freelance trumpet player in Los Angeles. WHEN: Friday, March 15th, 2019, 8:00 p.m.